Specialising In Sundanese Food, You Will Find A Wide Variety Of Dishes On The Menu As Well As A Very High Standard Of Quality Service. Dapur Sunda Restaurant, A Favourite Includes The Roasted Crispy Gurame, Beautifully Presented Along With Their Sensational Soya Bean Ketchup. Dapur Sunda Welcomes Families, Groups Of Friends And Colleagues, Providing A Cosy Atmosphere To Enjoy A Relaxing Meal Together. Dapur Sunda Restaurant Is A Halal Restaurant So They Do Not Serve Alcohol. Food Is Very Average West Javanese Cuisine. The Ambience And Service Though Is Very Good. Nice Setting In Private Dining Rooms Above A Fish Pond. 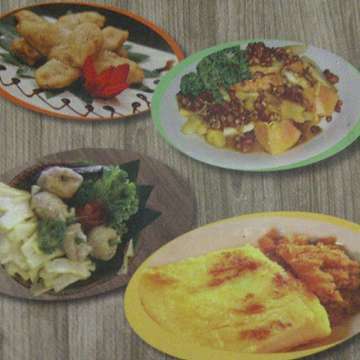 Menu bervariasi. Sayang sekali rasanya ngga ada yang pas. Satu satunya yang lumayan ok adalah sup gurame asamnya.